Do kids go to the playground with a sense of purpose? What is your yoga purpose? The ultimate yogi is the one who is described as child-like, with nothing to prove, full of joy, caring and emanating trust and love. This sounds like we were, when we used to be kids. Somewhere along the way, the adult need to have a purpose and a goal got thrust on us, and we have carried the burden of this since. (who not many in India, as usual know, was from the South of India) after setting up the Shaolin style of philosophy and fighting skills, got on to a bullock, and gave his treatises to the man at the gate of the city, and rode off into the horizon. The same is true of Adi Shankaracharya who, after preaching Advaita and setting up maths // institutions in the four directions of this country, disappeared without a trace. It was too powerful an example for the rest of us to follow. It is interesting to see how when new age gurus try to rekindle our interest in these ideas, they actually ending up adding a "purpose' to such things. The whole eastern idea is to do everything completely and move on. It means the journey is the destination. You can all see the travesty here, which unfortunately everybody is pushing down our throats. The path is not leading anywhere, in eastern thought. It is where you find yourself. But unfortunately now they have made this path lead someplace, so many people start seeing imaginary goalposts, they have targets, they have experiences that assure them that they have reached some important spot in their path. They also believe their path is more special than others (ha ha, the competitiveness reasserts itself). To have a purpose on the path, makes you a spiritual materialist. It is now so entrenched that we are beginning to have to have a purpose in everything we do. I believe part of the problem of the world lies in this terrible need to infuse purpose in everything. Some things have purpose, some don't. Once you make a habit of putting a purpose into everything, it becomes a terrible need in itself. We have to shake off this unnatural need to have a purpose. Be pure. But this idea is not accessible, like it was earlier. We have no real leaders today who can communicate this idea as a matter of transmission. Most leaders today are regurgitating old ideas but are themselves so full of purpose and ambition, arthat they have set up empires attracting followers with equally exalted goals. The need for today is to have a part of our lives where we are childlike, with no purpose. When a large swathe of humanity has this joyful space within, we would create a different world, with less strife, more giving. The fear of the void, makes us put stuff and purpose into it. To understand it, you have to be fearless. This quote of Bodhidharma: If you use your mind to study reality, you won't understand either your mind or reality. If you study reality without using your mind, you'll understand both. It is a trick, to see a purpose in all things. I was trawling through this book on Tao and Dharma. It is one of those things, you have so many books, but suddenly you find yourself reading several books that together seem to sort your particular problem in that particular moment of your life. So this book Tao and Dharma, by Dr Robert Svoboda and Amie Lade, threw up these natural remedies for "heat". The solutions are so commonsensical that it is worrisome that we have to read it elsewhere to do what is natural. On this note, moonbathing is a suggestion. I remember as kids we would take our mattresses, or mats, which were more commonplace, and bed sheeets to the terrace, and sleep in the open, unafraid. There were no dangerous predatory human beings, or predators (since we did not encroach forests, those days), and mosquitoes did not attack us so much because, well, there were their natural predators like frogs etc in plenty. Now we have turned nature topsy-turvy, so there are more of pests and pestilences. And human beings are turning into monsters. So that sort of innocent moonbathing is not as common as before. Perhaps in villages, with little choice, people still do this. And perhaps that accounts for less crimes there. So, this suggestion by Dr Svobodha is for cooling down an aggravated pitta -- which causes inflammatory conditions. 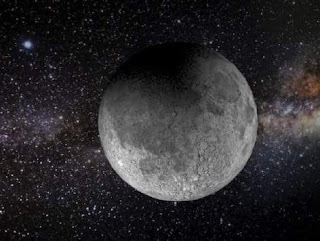 In case you cannot sleep on your terrace or any terrace, walking under a moon, (which is possible, still, if you have parks ) or in its light, sitting near a window where the moon is visible is still a good option. It is the sense of the night. A kinesthetic experience of nature, close at hand, that can soothe away anger, which is a pitta condition, and aggravated vata (of anxiety). Kapha naturally seeks out the moon. But Pitta dosha needs the moon. Let us know of other possible ways in which you could moonbathe.. watching a video? Or reading haikus on the moon. Taking holidays to spots where it is possible to moonbathe. And keeping track of the lunar calendar to know when full moon is on, or when it rises, and position yourself in that spot, once you locate it in your home! Or in its vicinity. Happy cool down to you all. I first read of the Kubera mudra in the Mudras: Yoga in your hands, by Gertrud Hirschi. I was super excited and immediately started connecting to some mudras/hand gestures. In the yoga-crazed of a neo convert I started reading up on all mudras, bought up books, some repeating themselves, and then downloaded several from all over the internet. Of course, with the maturity that comes from regular practice, now I have trimmed by enthusiasm somewhat and realise that I need to keep a few ones for regular practice, and dip into others, as I need them for healing. And also, as I started gaining some insight into them, I realised that not all can be practiced continuously. 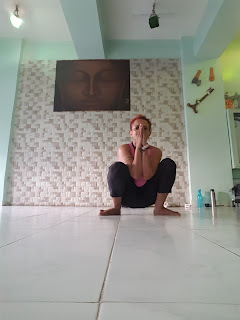 This was also the time when I started making the connection between yoga and ayurveda. 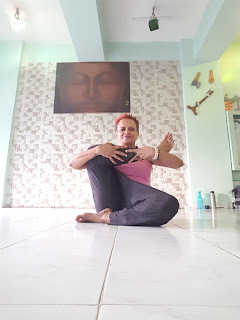 Each mudra is also dosha-specific and those with specific doshas must not overdo those mudras that are surely going to aggravate their conditions. Nowadays I see mudras, suddenly discovered by the asana-intense yoga community, being dished out like pretty spa gifts. And sigh! Any case, this mudra is dope! Kubera mudra, Hirschi, had said was a wish-fulfilling mudra. I have myself never practiced it, because I have inhibitions asking an higher power for material things. But wealth is not always about material things, you realise. It also the freedom to explore, and the support that allows you to do that. It is also joy in simple things. It is so many other things, than real money. So, today I could look at this mudra differently. It is done as shown in the image attached. Tips of middle and index finger touching tip of the thumb. Other fingers pressed down. Done for each hand. And whenever you wish. The middle and index finger stand for ether and air element respectively. In terms of impact, they stimulate the mind positively, keeping it upbeat. The earth and water elements, represented by the ring and and little finger, are depressed in this, and that means the practice controls lethargy and sensitivity. So, on very "technical" terms, it uplifts the mind, makes it confident and focused and fearless, and controls lethargy and sensitivity. All ideal in the recipe for success and focus. Its been over two decades since I started practicing yoga, but i have never actively practiced this, as I explained above. But now, I am a little bit more sensible, and perhaps its time to start practising it? Let me know if your wishes came true. Walking on cobblestones can keep you fit? I had a serendipitous moment. I was reading a book on the Japanese route to happiness (Ikigai) hat the Oregon Research Institute study -- provoked by some western scientists watching the Chinese do this ritually at their parks -- confirmed that walking on cobblestone, barefoot, had tremendous health benefits. The study was done with about a 54-strong control group, of people over 60s and into their 90s, done over 16 weeks, thrice weekly, for an hour. This exercise proved terrific benefits, over conventional walking. * Mental and physical well-being. Traditionally, the Chinese did this because in acupressure therapies, the sole of the foot has the body map of the entire body. And walking on the uneven, but soothing pebbles, impacted them, activating points that gave improved overall health, better sleep, and pain relief. So I googled for cobblestone mats, and was astonished to find that these are indeed available, even locally. Though at a price that is a bit out of range for me. Maybe in a few years time and when I really need it, I will buy one on EMI! Any case, I ordered a synthetic cobblestone mat -- and will get it by month-end. Will post further on that, and how it feels soon. Why not beer yoga? 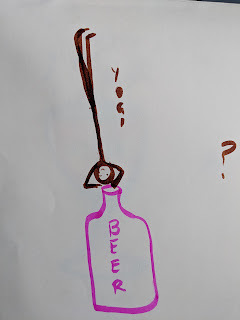 Here's why..
Somebody asked me about this, so I am putting my thoughts here: Why not beer yoga? Here is why. Technically, Hatha Yoga Pradipika says there should be no hard or fast rule about anything. Adherence to rules is itself unyogic. Chapter 1, Verse 15, clubs "adherence to rules" as amongst the many things that destroy yoga. So, you can see why the beer-swilling and wine-loving yoga practitioners believe they are in the right? Right? Wrong! Because the same verse warns against "Unsteadiness". 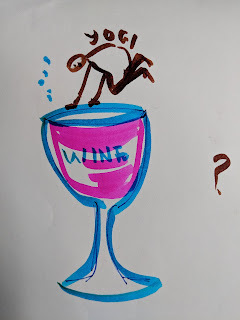 While of course, many drinkers take pride in their threshold limit, it still is unclear what can trigger unsteadiness even in a heavy drinker (who, if he/she did yoga regularly, will not be a heavy drinker in the first place). So, the same rule that some people use to run around doing their wild thing is also advising against it! 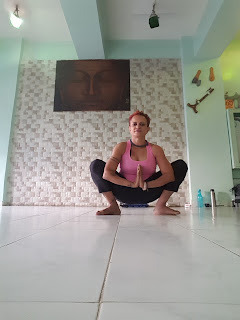 While the Hatha Yoga Pradipika exhortation not to adhere to rules can be seen as an invitation to do anything, it is simple commonsense that is also very much part of yoga that you do not eat /drink anything before a yoga ( or any work-out). 1) Too much of water even can cause water intoxication, actually leading to cramps. In fact, its old news that drinking a lot of water or energy drinks before a marathon was promoted avidly by manufacturers of these drink till somebody realised that this was causing terrible accidents, even fatalities, on the track. The body is on a high-stress mode during physical activity, and needs to release its energy packets fast. Too much of water actually dilutes and messes up the electrolyte balance of the blood, confusing it thoroughly. 2) Work-out /any physical exertion makes you dehydrated. Alcohol makes you dehydrated? So do you think this is a great combo? Ahhh, it would call for great suspension of disbelief to pretend that it is good! 3) Even mild alcohol interferes with muscle recovery after a work-out. So, I rest my case. 4) The other obvious thing is, if you talk to anybody who is a regular yoga practitioner and not looking for entertainment on the mat, the high comes from the practice itself. Serious yoga practitioners do not need these incentives. Its not just a mystical or spiritual thing: any physical exertion releases the body's own opiates (endorphins). You get a super-kick from a strong practice. 5) A simple analogy should explain the above point even better: a beer yoga session is akin to a one-night stand, while a strong personal practice is like a strong loving relationship. Everybody has their choices even here, so it sort of puts a label on what you are about, on the mat. So, if you say you do beer yoga to a "real" yoga practitioner, they will walk away from you. Its not that they think you are scum, but that they feel you are not serious about the practice, and so have nothing in common with them. There has to be a respectable gap between the time you consume anything (beer or water or food) or yoga practice. Two hours, after a mild intake, and four hours gap between heavy food. Unlike other workout, here you do inversions where the torso is upside down. In many poses the body's blood pressure is switching rapidly, to adjust to this movement of the blood and the body and its load carrying impact of some movements. Alcohol will can have a disastrous impact on this. Not just alcohol, anything can even cause fatalities. 7) Think of it: the flap at the osephagus is there to prevent the food you ate from coming up, If you fill up the tank,then flop yourself upside down, it puts a severe strain on this sphincter, Short term, you would be lucky to get away with acid reflux, But it depends -- if you sphincter is already flaccid, you could just send something up that can actually choke you. You may have heard of some drunk choking on his own vomit? Well, that is technically what could happen when the flap releases stuff it should not, while doing an inversion, after ingesting anything, including water. Also, why would you want to send the stomach acids into your gullet? Stomach acids are so potent they can burn holes in a kerchief. Imagine the impact on this on your throat, where it should not be! And if you eat or drink and do any inversion, you are creating all the ideal conditions for a serious problem. In the long term, the sphincter is even likely to get more flaccid and create chronic conditions of acid reflux. It is not as simple as it sounds. Its an extremely distressing experience. Plus, it is often symptomatic of oesophagal cancer. If you still argue in favor of beer yoga, god be with you. I have nothing further to say to u, and your ilk! It is the typical tale of ignoring what is in your own backyard. So, since I can remember I know of chyawanprash. I also know other types of jelly -- but having something like that shoved into your mouth while recovering from some sickness puts you off such things as a child. Now, with foresight born of five decades of life on this planet, and with the desperation that comes from that I have suddenly, and fortuitously, rediscovered this powerpacked jelly. I have been having it for a month now, twice daily. And find that it does do something to old aches. Whether that is part of its design, I do not know. But it has helped my old knee injury so much so that I have restarted jogging and skipping, which I set aside every time my old injury starts acting up. All of us have these ups and downs with our body. But the ups have been more, and the downs less, with this chyawanprash. So, I tried to research a bit about this. And my favorite ayurvedic doctor on this, Dr David Frawley, apart from discussing the ingredients, gives it the metaphysical spin that really appeals to me. He says that it promotes love, longevity and good fortune. It is regarded as the long-living tree. And that is is used to treat mental disorders (Book reference: The Yoga of Herbs). He is using all my favorite words. Appealing to all that appeals to me. I love the idea of the chyawanprash being a tree. And a long-living one, is magical. And if having this jelly gets me good fortune, who am I to sniff at that? The base, he explains, is Amla, raw sugar, and ghee (another traditional ingredient that has enjoyed a happy comeback). And then each of the ayurvedic school, possibly depending on the region they are from, have different formulations. Every time at look at a label (and till now have tried two brands, one ordered from Kerala online) they have a long list that appears to go on and on. It makes me feel good, because like most of us I rather talk of health than do much about it. So to think that just a few teaspoonfuls is getting my quota of health for the day is a very special feeling. On the day I forget I fret a bit, but it is a good sign. I mean, it is about self-engagement when we take the trouble care for ourselves. The more I read of health, thanks to my being a yoga instructor, I keep learning that self-engagement is the only way to ensure you do not go downhill. If you let go, it is going to create the grounds for mental and physical decline. 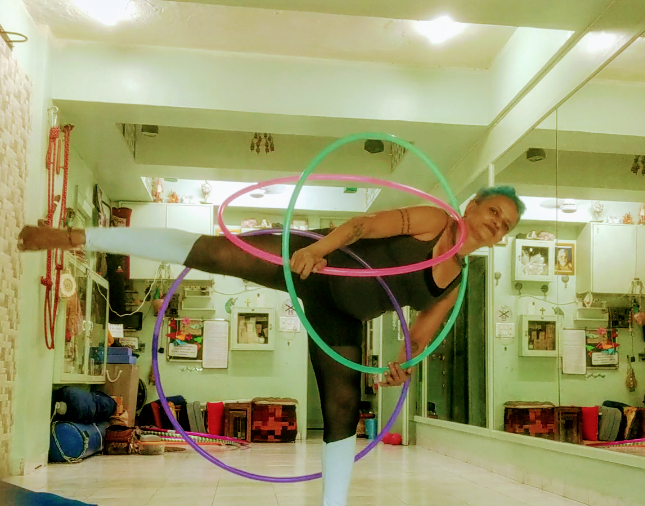 Having watched my grandmother suffer so much towards her end, with decline in physical and mental faculties and the way my mother had to struggle in taking care of her with no help whatsoever, has made me determined to focus on health. Health above all the other things that seem to attract the rest of the world. My grandmother did not know much of what she suffered, but the ignominy of losing your faculties, that left a deep mark on my mind. As a kid I have seen so many deaths -- and many of them long-suffering where the burden of most of the care-taking fell on my mom, that has left a deep mark. I see others around me glibly ignoring health as if they feel it is a given -- it bothers me because it is a lie. Health has to be worked upon. It is like an investment. You cannot expect a lottery. And other people's savings will not help you. You are alone -- when you are unwell. Even the ability to bear pain, that comes from strength of the mind. If things must go downhill, at least we must walk to our grave and not flail our way into it. Apparently a young princess married an aging rishi, Chyawana. His youth is restored by the Ashwin twins, through the use of rejuvenating herbs all of which find themselves in this jelly. And that, sort of sums up why this is regarded as an essential part of kayakalpa-- youth giving practices of ayurveda. So, whenever I pop the gooey jelly in my mouth, I have this story running through. Its a powerful affirmation, not even consciously attempted. It now belongs to the stuff of yoga legends ..that the stellar yoga guru Iyengar won instant acclaim for having propped an octogenarian European queen into the headstand. So age is never a barrier for learning it. However even simple tasks need prep. And standing upside down is not simple. So it needs more prep. If you are not used to any physical activity then u need more prep. And perhaps need to be initiated into it with props. 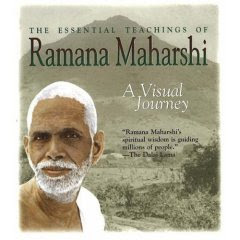 I was lucky to have trained partly in the South of India with Asana Andiappan. And in his institutes he would have a simple pulley to help even stroke victims enter the headstand with a lot of support. It made sense to me ..to activate sluggish parts of the brain and spine. 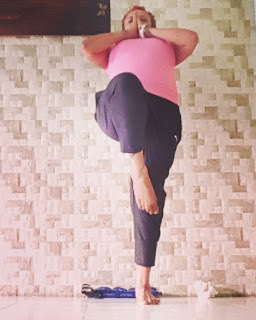 I have seen older women ( who in other parts of India will simply baulk at it) and even overweight people ( who normally have several inhibitions about inversions) just go to the corner reserved for the headstand and when their turn came, happily stand upside down for quite some time. It powered my own practice. But I learnt that to do the headstand scientifically helps makes it very easy. Here is my brief YouTube tutorial on the simple poses u need to do before u start on your headstand. So good to be back 😂 Remember the time ..if u belong to my generation..when u didn't have electronic entertainment and had to play out in the sun. Tough games. Climbing trees. Getting bee stun. And not wilting when u fell. So here is one of those games. Of Yoga Belonging to a period even earlier than my childhood. Its on my YouTube channel Yoga with a view .. Watch it. Like it. Subscribe to it. It's not about me at all. About the spirit of yoga .. I have restarted my blog after a long gap. My apologies. But here is an immediate yoga tip. No side effects. Works. If nothing else, offers topical soothing. Third eye healing, for those who like to spice up their yoga knowledge with metaphysical connnections. Belly fat is the very devil. It makes u feel bad. Its as if it implies u are not being disciplined about your food or your health or your exercise. Its not so much about how it makes u feel ugly. Its really about making u look bad as a person. The implication of belly fat bothers many of us I think. Its demotivating also ..especially if u are trying stuff u have been trying efficiently for years but now see that these same tricks are not yielding the right results. So I too have a yo -yo relationship with this despite my vigorous approach to health. * It becomes exaggerated when u are stressed. The correlation beteeen stress and belly fat has been well established..so we need to de-stress with a firm intent. Funny books or movies. Cooking good food. Art and craft and hobbies. And a regular workout. They elevate your mood and release stress. * Have a dynamic workout. Interval training..short bursts of exercise followed by relaxing stretches..even for 10 / 20 minutes thrice weekly will have immediate impact. This is a new breakthrough but entire researches and books vouchfor it. So do I. * Diet is the key. U have to consult a professional if needed but do it so u feel the impact immediately. Trying something that works for your friend may not be the right answer for your body type. * With yoga ..to lose belly fat ..incorporate dynamic sequences and flows( as shown in video). Dynamic poses are more challenging and burn more fat especially at the belly and thighs. 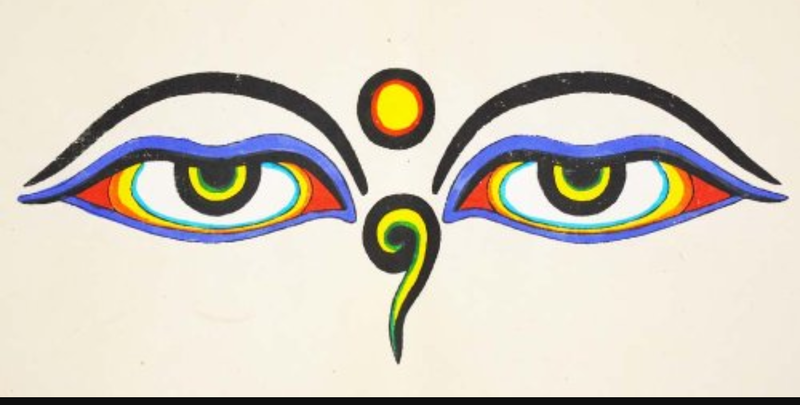 I have these Buddha eyes all around my spaces ..whether it is my home or my work space. Something about the brilliance of trataka/ eye exercises infuses itself through them to me. Its amazing that despite all the drama and fervour over yoga not many classes or teachers encourage its practice. All that I know of this I know from the Bihar school of yoga books. I was browsing a Hatha Yoga Pradipika translation by Sw Muktibodhananda and rediscovered its magic. According to the author Swatmarama trataka not only sorts eye problems but also removes "fatigue, sloth". But even more, according to the translator it awakens the susushmna nadi ..the spiritual consciousness. It can even arouse clairvoyance, telepathy, telekinesis and psychic healing. Clearly for such states to be created the practice must be intense. Done at brahmamuhurta ..the time of the divine ..4 to 6 am. Perhaps because of such powers it was always meant to be a secret practice . Yoga ia very ritualistic about personal care. Its sister science Ayurveda has elaborate advice on the type of massage oils / powders each ayurvedic dosha must use. I have super books on this by Dr David Frawley and Harish Johari. *That oats make great face masks. *They are anti-wrinkle. *They brighten skin. * Exfoliate..remove dead skin. *Tighten pores. *Have stuff ( saponins) that acts like natural soap and remove grime from inside the pores. * Lots of fats to remove dryness. * Lots of other natural moisturizing agents. 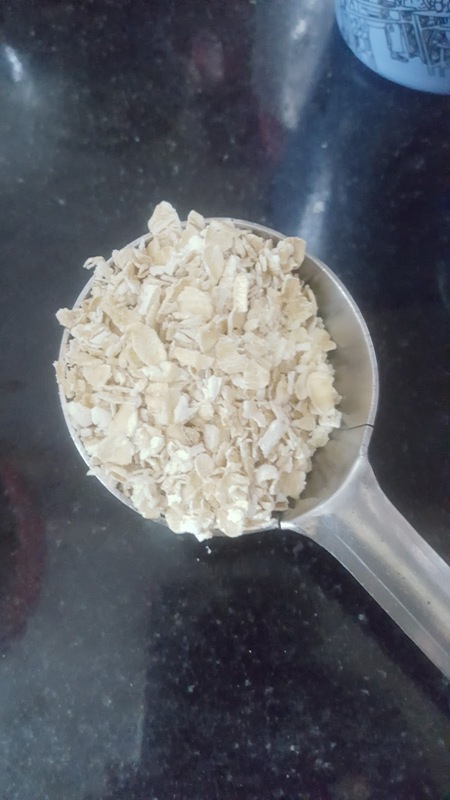 Basically it depends on what you mix with the oats ..honey or milk or powdered sunflower seeds or almonds or lime juice ..The oats must be softened by puttibg it in a blender. adds its own goodness. If u search online ..on valid sites ..u will find lots of skin care recipes. So I am not giving u that. Its better you choose according to your skin care needs. I did my own pack by blending oats with sesame oil and rose water as a bath scrub. Feel spanking clean, I must say. Biologists are still trying to find the elixir of youth. For some, like Dr Elizabeth Blackburn, its a mission. If u read her books you get a clear idea that a virile mind ..which is connected to the rest of your body ..is a great way to maintaiñ youthfulness. The nerves are how your body tunes in to who u are. Their vitality is important. This pose here called namaskaranasana ( prayer pose) is not only intensely challenging at a physical level but also "excites" the nerves all over the body. Nerves in all the limbs are set off positively. And that difficult joint..the hips ..become stronger and more flexible. After 50s strong hips could mean longevity, youthful mobility and a better quality of life. The chest also opens and collapses in a manner as to strengthen it and release hidden tensions. And the neck is also toned. The neck ..at a metaphysical level.. .often collapses at the slightest hint of conflict or stress. And I cannot help but to point out that to execute this pose you need strong knees and ankles and an ability to squat low. In what I call the Indian toilet squat..but more on that later. When I started yoga I was completely overwhelmed by the science behind yogic practices. And the branch of mudra yoga was one of those things that mesmerised me. Despite a lot of spiritual and religious significance to mudras they are really based on the science of neurological brain map of body parts. I do not want to get into this but have written a lot on it. All of my ĺinks on this was drawn primarily by the wisdom of Swami Satyanandaji's writings. 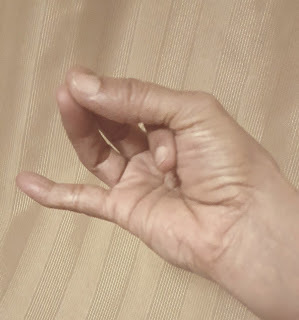 This mudra shown here ..was amongst the first one I learnt. Its also called hridaya mudra, amritsanjeevani mudra. These names suggest the significance of this mudra. And only recently I learnt that this can even help in emotional problems, specifically dealing with heart-related ones. 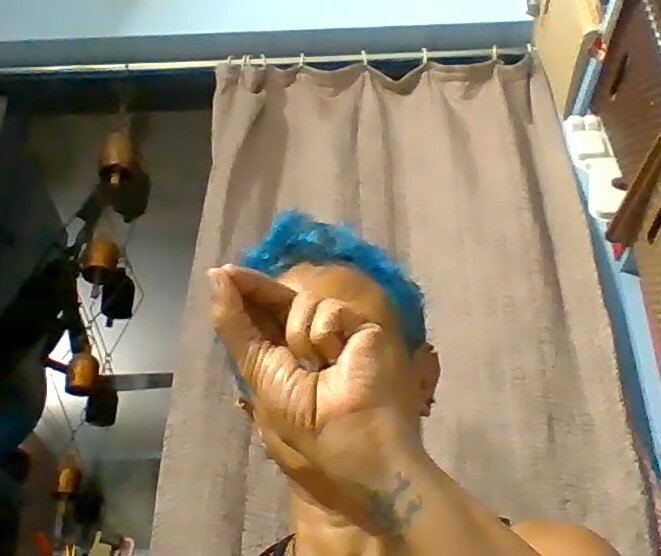 For real impact u need to hold the mudra at least for 30 minutes. U can manage this by using it while meditating or doing pranayama. Or even while watching TV. If u have high blood pressure, çirculatory problems, heart-related issues or a broken heart ...this is the mudra for u. Why we resist grounding, healing yoga? Even practitioners who do not do stunts on the mat ..they look far younger than their non-practicising counterparts . Often these easy poses are more impactful because they have less contraindications. And they work because they activate powerful acupressure points. All forward bends are said to keep your skin glowing. Simple, Watson😉Its because these poses make your face flushed with blood. How do u glow with this pose? * Major acupressure points at the navel are activated for relieving water retention. One of the reasons there are those ugly pouches in the face ..due to sluggish release of water logged in the tissue. * Promotes digestion ..so all the nutrients are rightly absorbed. Skin needs a lot of maintenance and repair that is supported by your food. * Enhances deep breathing. And good breathing is ABSOLUTELY essential for youthful skin. * Impacts your uro-genital system ..which deals with your moods and hormones..both super important contributors towards skin glow. * A huge acupressure point at the buttocks called vajra nadi is activated ..it deals with the repairing systems of the body. This pose is called balasana ( child pose). There are similar poses with different arm positions..which have similar impact ( shashankasana/ hare pose). In case u have a knee problem u can keep a cushion under the knees. In case u can't touch forehead to ground also a cushion is a good prop. The prayer we say at our ashram before a meal sums this up: what is offered is god. Brahmarpanam ..If u are what eat and what u eat is god, the fire on which the offering is made is also god. Brahmahavir..U get the general idea of where we are headed..that your gut is god. The mind is given the halo. But we forgot biologically the brain was solely created to get us food and prevent us from becoming another creature's food. That later the brain evolved enough to forget its own humble origins or to discuss quantum physics is the subject of another post. But suffice to say the gut is a very powerful organ. So powerful that it can make decisions that bypass the brain. Has an exclusive hotline to the brain called the gut-brain axis. And it can release hormones that can subvert those released by the rest of the body's juices. And this system is host to several armies of microorganisms that have their control panels. So keeping your stomach healthy is crucial for every part of who u are. This pose called jatharagniasana ( abdominal fire pose) or udharakarshanasana ( abdominal stretch pose). Like I say u will find several tutorials for it online. U can keep knees down as well. Or lean on a wall. 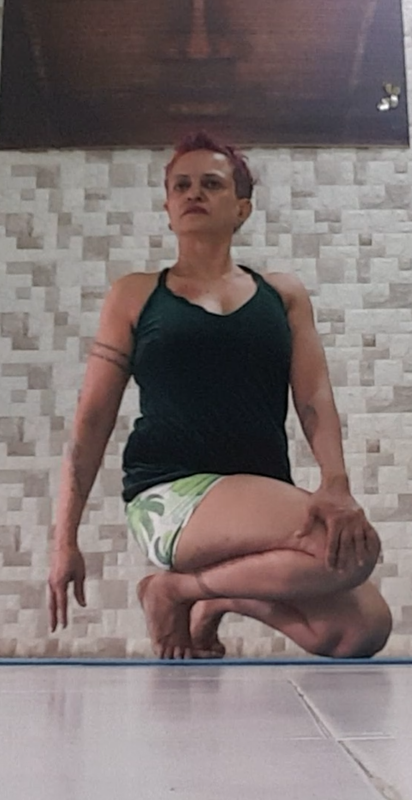 If knees gives u troubleu can sit on a chair to modify the pose.